Oh Boy, What Joy! Bok Choy!! Sometimes a tasty dish is just too easy to achieve. Take baby bok choy for instance. I really like this vegetable for its versatility and mild flavor. And although we associate it for the most part with Oriental cooking, I like to give it an east meets west twist. My inspiration was taken from a survey of what was in my fridge and pantry. I had some pine nuts needing to be used up. I had a small piece of Gorgonzola dolce cheese. So, I cut a clove of garlic into paper thin slices and added it to 1 tablespoon of olive oil in a sauté pan and cut each baby bok choy in half lengthwise still attached to the core. I placed them cut side down in the pan and covered and cooked them over low heat just until a knife could easily pierce them. That took about 4 minutes. I dusted the pieces with salt and pepper. Meanwhile a handful of pine nuts were toasting in a small sauté pan until fragrant and crunchy. The cheese was cut into small pieces. 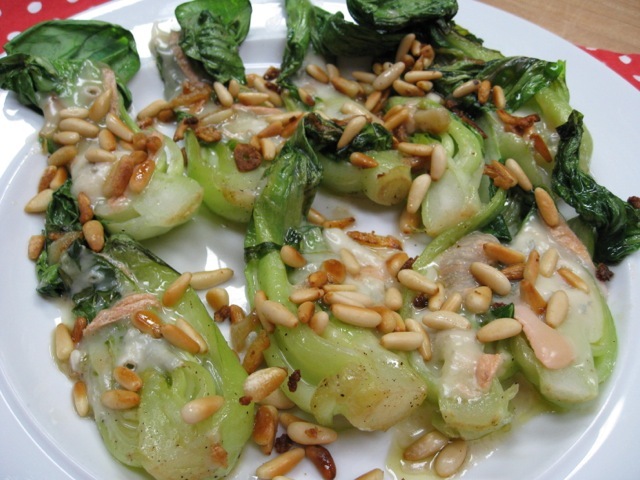 The bok choy was turned over and the cheese scattered over the tops. Off the heat, I covered them and let the cheese melt. The nuts were sprinkled over the top. The dish was a joy to look at and everyone said “oh boy, bok choy.” We ate it in silence, savoring a genius taste and idea. YUM!!!! That just looks delicious! I've been looking for a way to treat bok choy that wasn't asian (been there done that) and here it is! It looks like a great way for other veggies too! !